The Your First Year calendar would be a nice addition to 2011. Cute designs! 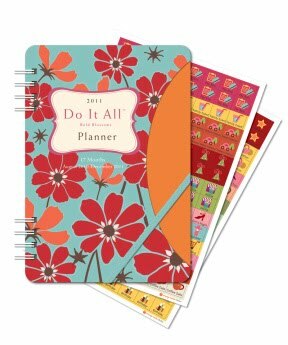 Orange Circle Studio is a publishing company that creates gorgeous planners and calendars to help you stay organized. They're not just pretty, either- all Orange Circle Studio products are recyclable and printed with soy-based inks on FSC-certified paper. Their daily desk calendars are also entirely plastic-free! 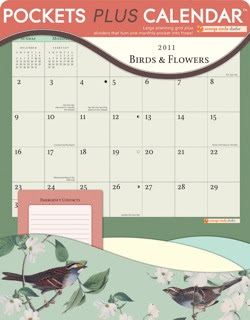 They offer a wide variety of traditional wall and desk calendars, plus some nifty planners and unusual designs, too. I received three different Orange Circle Studio calendars to try out. The colors are gorgeous and the printing is really outstanding on all three. The Bold Blossoms Planner is a great size to toss in your bag. It features a storage pocket built into the cover, stickers to mark special events, tear-out notes for shopping and to-do lists, and shows one week across two pages with plenty of space to scribble in your info. I'm constantly trying to update my paper calendars with my iCal so this is a great back up to have with me at parents group and volunteer meetings. The Bold Blossoms Planner makes it easy to cross-reference my weekly schedule with dates in the future. 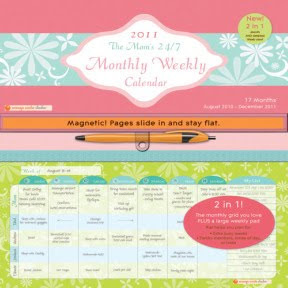 The Mom's 24/7 Calendar can be wall-mounted or hung on the refrigerator with the attached magnetic strip. The top portion is a monthly calendar with big spaces to write in important dates and the bottom portion features undated weekly planning pages with tear-off lists. There is space for Mom's activities and up to four other family members, as well. We're just starting to have a bunch of extracurricular activities for Roo and Jasper so I can see how the multiple family member scheduling would be handy for older kids. I also really like how the Mom's 24/7 Calendar can be a central location for everyone in the household to add their info to. If our fridge were magnetic, I would totally post ours there to keep my husband informed of what's going on each week. As it is, he has to come into my office to check it out. We haven't gotten into the swing of it yet but I hope it will become a natural, everyday habit. The third calendar I received is the Birds & Flowers Pockets Plus. The printing on this one is really lovely, with almost a vintage feel. My husband asked if it was Martha Stewart brand, I think because of the color scheme. It definitely could be! I haven't actually used this one yet since it's not 2011 yet but I can see it being handy for bills, event tickets, etc. I also think it would make an ideal holiday gift for teachers or family members. To enter and win your own set of the three calendars reviewed here (a $45 value! ), please comment on this post with your favorite item from Orange Circle Studio. Entries will be accepted through November 17th and I'll pick the winner using Random.org. US readers are eligible. For an additional entry, follow Orange Circle Studio on Twitter, like them on Facebook, post my button on your blog (see code on sidebar), follow my blog, follow me on Twitter, fan me on Facebook, fave me on Technorati or subscribe via email or subscribe via reader. Leave an extra comment letting me know what you did for each additional entry. I love the mom calendar idea! I like the Bold Blossoms Do It All Wall Calendar. It looks perfect for our family. I follow orange circle studio on twitter. I love things that look exotic so it was rather difficult to decide between the tropical islands calendar and the three different orchid calendars. I'll have to say my pitiful orchid collection could use some encouragement to grow and bloom so I'm going to say that my favorite on the site is one of the orchid calendars. My favorite item is the Bold Blossoms Planner :) *Thanks* for the giveaway! their wonderful line of products! "Essence of Asia Pocket Calendar!" Super cute ideas! I'm constantly going through note books I carry in my purse despite having an iphone. My favorite item is the Bold Blossoms Planner. I love the cover and would love to get organized with it! I like Michelle Obama Wall Calendar.